Experience with being a gym leader: I have no previous experiences in being a gym leader. How long have you been playing Pokemon/Pixelmon? : I've been playing pokemon for 8 years when my sister gave me her fire red copy of Pokemon, and I've been playing Pixelmon for 3 years about to become 4 soon. Do you play Pokemon competitively? 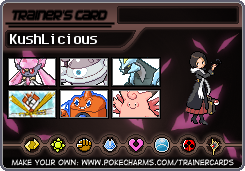 : Not that much, but I have been playing Pokemon showdown recently competitively. How long can you play per day? : I can play for about 6 - 8 hours on the weekends and once I move to my other house, I would be able to play much more often on the weekdays. On a scale of 1-10, how would you rate yourself at competitive battling? : On a competitive ranking, I would rank myself a 6 since I have had a lot of Pokemon experience over the past few years and I have past experience playing competitively on Pokemon Showdown and other Pokemon related games. Why should we pick you: I believe I am a well-trained candidate for the Water/Ice gym. I have consulted with many people on my team and I believe the team I have made is at peak performance for this type of gym. To add, I am often online on the weekdays normally the whole day and I would be open to taking battle request whenever. Gonna point out something I instantly noticed, 5 members of your team get shreded by LO Breloom, the only member who can deal with it is Kyurem. Thanks for pointing that out, Kush. I'll take this into consideration for rebuilding my team. I appreciate your feedback.